I want to completely ignore the Charlie Sheen situation, but I can’t. I want to be afraid for Charlie Sheen’s health, what with his history of drug problems and the way his TV show has been pulled off the air due to his behavior, but every time he opens his mouth, something crazy/great comes out. Especially in the wake of his recent media blitz, press releases, and general interviewing festival, Charlie just keeps opening his mouth and awesomely bad statements keep springing forth from his brain. I have to admit, I want to live the Sheen Dream, and thanks to the Charlie Sheen quote website Live The Sheen Dream, now I can. It’s a very simple idea. There’s a crazy looking picture of Charlie Sheen. 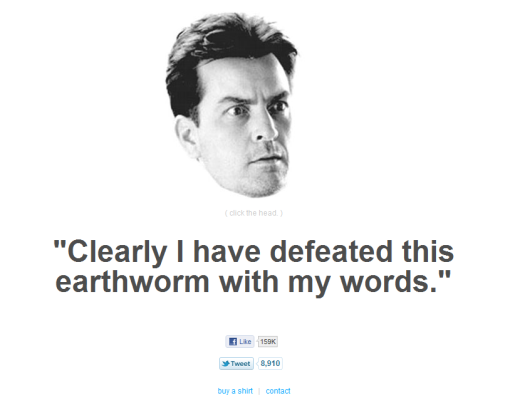 Every time you load or refresh the website, a new Charlie Sheen quote comes forth for entertainment purposes. It’s simple, like the Swine Flu Detector website, but just because something’s simple doesn’t mean it isn’t great. This is great. It just allows Charlie’s words to speak for themselves. I mean, how could you possibly make the quote, “I’ve got tiger blood, man,” better than it already is? You can’t, that’s how.